The awareness of futsal around the world is still relatively low. Some have a distorted image of what it is and may see it as unappealing. The impact is many are denied the opportunity to enjoy playing or watching this spectacular game. There are those more fortunate who have been exposed to futsal as young players, developing a talent and love for the game. They may aspire to make it their future career but the reality is the possibilities are severely limited due to the professional game’s lack of development. The Spanish Premier Division is one of the most renowned futsal leagues and has some of the best players in the world. The average salary in the league according to official contract data is just over 28,000 euros a year. A very low amount compared to more popular sports. The result is career opportunities are only available for a few. I believe effectively promoted, designed and presented futsal competitions are the solution to these issues. These will attract more interest, spreading awareness of what futsal is and funding viable professional playing careers for many more. An extensive research project I am carrying out on generating fan interest in futsal for my UEFA Masters studies has included an investigation into how clubs build followings. I will share some thoughts on this topic in the I hope it will be helpful for those running clubs. The instinctive presumption is that building a fan base is heavily or uniquely dependent on success on the pitch but research finds it’s not such a significant factor. A survey of adult sport fans by Deloitte found only 10% chose their team based on performance. This is also demonstrated by core fans, the biggest contributors to sustaining professional sport, whose interest is less impacted by their team’s current performance. Sport is unique in this sense as in any other industry people will quickly switch to an alternative if a product or service doesn’t meet their expectations. How is such unwavering loyalty acquired? The most important reason fans follow a club is a shared identity and connection. Club management can have a big influence on this and it can be achieved with little investment, unlike success on the pitch. I will provide some ideas on building a club identity that, alongside engaging fans, can help build a loyal supporter base. The best example of using identity to gain loyalty and influence people’s behaviour is from consumer product companies. They do this through building brands that persuade customers to buy their offerings over the similar alternatives of competitors. They invest heavily in creating and establishing their brand personality, which is the characteristics and values they represent. One of the most successful examples is Apple who have a formed a brand personality of creativity, innovation and independent thought. I’m sure those in careers where these qualities are desirable choose Apple products ahead of lower priced alternatives more than the average of people on a similar salary level. The evidence for this lies in any coffee shop where digital marketers and graphic designers congregate. The impact of brands on people’s behaviour and choices can be quite significant. Take this t-shirt example from strategy expert Adrian Goldthorpe who has helped develop one of the world’s most popular sports brands, the UEFA Champions League. A plain yellow Fruit of the Loom t-shirt costs a few pounds. 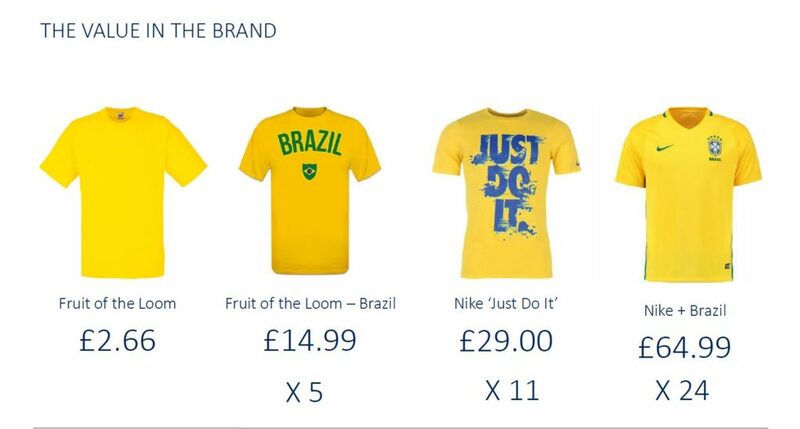 Stick Brazil football team’s logo on this and the price increases five-fold. Instead print on the Nike logo and it costs around eleven times more. Put the Brazil and Nike logos together and the resulting Brazil National Team shirt is for sale at around 24 times that plain t-shirt. The functional use and quality of these t-shirts are similar. So why do consumers desire one so much more than the other that they’re willing to pay 24 times the price? Humans survived by forming groups that had shared values and beliefs, allowing them to co-operate and work together. To be accepted in to a community, individuals must present the relevant identity. An individual can communicate their desired identity through associating themselves with things, such as brands, that have the known and established values they want to transmit. How does this all relate to a futsal club? They also have brand identities, being the characteristics and values that have become linked to them from their past actions and associations. These will reflect on the fans of the team so will attract followers that want to be part of that type of group and see these as their desired values. How does a club select the values it wants to associate with? To maximise its fan base it needs to find out about its potential or target audience. For a club trying to establish itself, initially it is likely to be the local community. They are usually the low hanging fruit as they have the lowest cost/friction/effort to attend your events which is where smaller clubs generate most of their funds. Plus a small club can be close to their community, giving it a competitive advantage over other sports whose bigger size makes this more difficult. The next stage is to find out what values do they associate with themselves? Maybe they see themselves as hardworking, underdogs, elitists, outsiders or some other identity. These can be found through local knowledge and research, i.e. asking them. Geographical location is one of the strongest aspects of any individual’s identity so this should be a focus. People strongly associate with the place where they live, where they were born and grew up or the place their parents originate from. The survey mentioned earlier found 40% of fans followed a team because of their hometown and 36% because of their current location or family history. Promoting a club’s identity with an area can be achieved by having homegrown players in the first team, representing the values of people in the region, getting involved in neighbourhood events, working with local organisations, supporting local charities, hosting games and events within the area, helping address community issues, having an academy where youth players can represent your club, organising get togethers between players and fans at places where they usually meet, and selling local food/products at your event. Once the preferred identity has been chosen, the club genuinely needs to demonstrate and represent these values in everything they do. Any inauthenticity will quickly become apparent and that is a value no-one will want to be associated with. Sharing and representing the same identity with your target audience is the first step but to capture their loyalty you need to engage with them to build a relationship, familiarity and affinity. This is the same process as when two people with common interests meet for the first time. Through getting to know each other they go from strangers to acquaintances and, potentially, close friends. It is the same for building a relationship between a club and a fan. A fan starts by not even being aware of the club’s existence. Through regular and constant engagement they get familiar with the club and what it represents to become a casual fan and then, ideally, an avid fan. 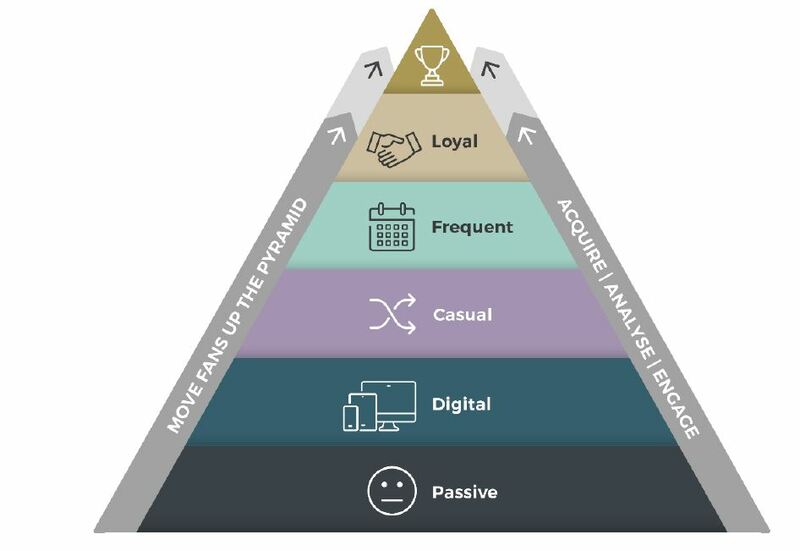 The most effective way to build the relationship will be through in-person engagement such as at your games but digital technologies offer the opportunity to engage with your audiences more frequently to reinforce the connection. Sports marketing expert Fiona Green of Winners spoke at the Futsal Insights Conference 2019 on how your most devoted fans will become advocates who spread the word to other people. Their existing rapport with the people they speak to and their independence from the club will mean their message is a lot more powerful than if it came from the club directly. This is one reason why a club should never become complacent and neglect existing fans, in the focus to gain additional supporters, because they will help do your marketing. Further, their affection for the club makes them potential volunteers and these are a vital resource for any developing club. This deep connection between a club and its fans can be built relatively quickly if you understand and engage the local community. Major League Soccer in America has been very successful at this. The league continues to expand and each new club must create a following from scratch in a country where football has historically not been a major sport. Clubs such as FC Cincinnati and Seattle Sounders have formed fanatical fanbases. By putting the fan at the centre of team’s identity, Seattle have become one of the most popular teams in the MLS. Since their formation and entering the league in 2009, the fans have had significant input into decisions and even chose the name of the team. They have a say on every aspect of operations and vote every four years on whether the general manager should maintain their position. Involving the fans closely in the running of the club naturally creates that shared identity and a feeling of ownership. The outcome is a highly passionate and loyal fan base that would normally take much longer to obtain. One of the best examples I have seen in futsal is my former club Futsal Dinamo. They had a head start as they are unofficially linked with the football club so were able to take advantage of the existing strong shared identity. However, by far the main reason they have built a huge following has been a genuine desire to represent their fans. Their deep integration in the local community has been achieved through activities such as charity games in nearby neighbourhoods, visiting local charities, a fan membership scheme which includes discounts at local businesses, official club/fan get togethers at local cafes or bars and supporting the issues important to their fans. The fans have a say in major decisions, like at Seattle Sounders, as they are the owners of the club. At every home game they have 1000-2000 fanatical fans who sing and cheer non-stop throughout the entire match. After every game we would join in their songs including going into the stands on occasions. All of these elements have combined to create a strong connection, interaction and identity with the fans that is reflected through consistent large attendances. I think, as a minimum, every club should have a fan panel to give a feeling of involvement and ownership as well showing the club cares about them. Even if this doesn’t give them the authority to make the major decisions, it should at least be a forum to provide their views with the power to decide less important issues such as the team strip and player of the match. Companies pay to have their customers provide feedback to be able to better serve them and in sport fans will happily do this for free. With the trends in society, I expect creating a community around a club will only become more valuable creating a big opportunity. Humans are social animals and they want companionship and connection but more of our activities and interactions are being carried out impersonally online and loneliness is now reported to be high even among young people. The decline of the traditional places people met in person such as pubs, youth clubs, religious centers, libraries, office working and high streets offers a huge hole that can be filled by sport clubs. Whilst we are on the subject of identity, an appropriate image is also vital for the sport as a whole to get the interest of casual sport fans, who later will follow individual clubs. One very successful sports marketer commented to me about the surprising lack of interest in futsal saying “I think it is almost a brand issue”. 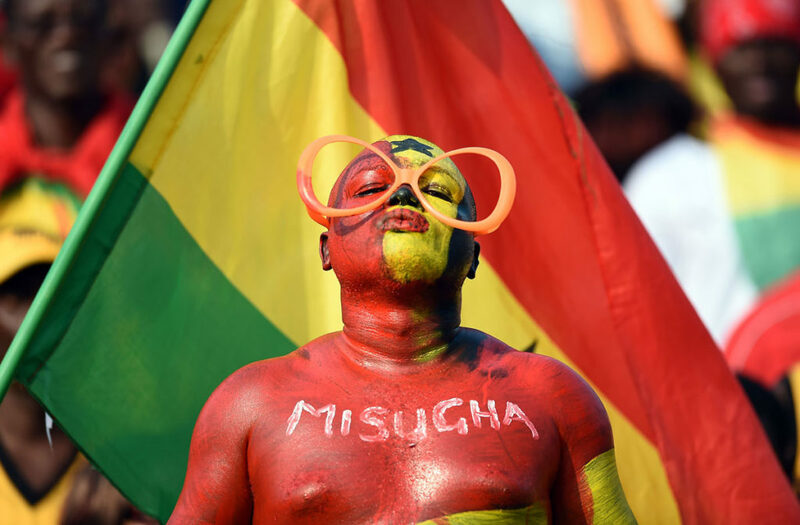 The identity that attracts fans to sport include drama, excitement, rivalry and competitiveness. As I explored in a previous post we need to get away from the images of an exhibition event, freestyle demonstration or football development tool that do not transmit these values. Academic Jonathan Sibley produced an excellent talk on futsal’s identity at the Futsal Insights Seminar in 2017 that you can watch here. I hope this article helps those that run clubs to think and discuss about how to grow their audience outside of just doing well on the pitch. As a devoted student of growing interest in futsal, I would love to hear of any initiatives that have been implemented with success. Through strong connections between futsal clubs and local communities the whole world will be able to discover and enjoy our wonderful sport! The post Building A Club Fan Base appeared first on DougReedFutsal. Holders Inter face their 2017 and 2018 final victims Sporting CP while hosts Kairat meet Barça in Friday’s semis. You can watch the finals thanks to UEFA’s broadcast partners and the live streaming of games. Årsmöte kommer hållas 4 juni 18.00 på ÖSK Futsals kansli i Idrottshuset (Eyragatan 1), dagordningen är enligt stadgarna. Han har varit i klubben sedan 2016. Nu blir Victor Huerta sportchef i Örebro SK Futsal. – Det är en ära att få detta sportsliga ansvar, säger Victor Huerta. Victor Huerta, 41, anlitades av Örebro SK Futsal under 2016 som huvudtränare för klubbens herrlag tillsammans med Mikko Seppälä – och sedan dess har han varit klubben trogen. Victor Huerta har sedan 2016 ingått i tränarteamet till klubbens herrlag under tre säsonger, och inför den gångna säsongen fick han också utökat ansvar som chef för Örebro SK Futsals U-verksamhet. Nu får Victor Huerta ännu mer förtroende och utökat ansvar – det när han blir ny sportchef i klubben. Victor Huerta kliver på rollen som sportchef omgående. – Det känns riktigt kul att få rollen som sportchef i klubben. Det är en ära att få detta sportsliga ansvar, och det blir en utmaning att forma en trupp från grunden och se utvecklingen. Jag är riktigt taggad och har redan börjat sätta mig in i de administrativa delar som kommer med jobbet, säger Victor Huerta. Örebro SK Futsal är i en stor utvecklingsfas, inför den gångna säsongen så utökades klubben med fler lag, det med bland annat ett framgångsrikt P06-lag, ett damlag, och en U-verksamhet. Det vill nu klubben spinna vidare på, därför förstärker man i organisationen. – Det händer mycket nu bakom kulisserna och vi jobbar med att utvärdera årets säsong med truppen som representerade oss den gångna säsongen. När det är klart, börjar pusslet med ledarstab, förlängningar och så vidare. Det är en härlig utmaning, säger Victor Huerta. Klart redan nu är att Tekle Ghebrelul, som har ett flerårigt avtal med Örebro SK Futsal, kommer fortsätta som ansvarig tränare för klubbens herrlag. – Det kommer bli lite förändringar som förhoppningsvis gör att vi står oss bättre kommande säsong i SFL. Vi har en ganska klar bild av vart vi står just nu och vart vi vill vara i framtiden. Det gäller att vara ödmjuk och jobba hårt, det finns inga genvägar som klyschan säger. Klubbens tidigare sportchef Christoffer Wickman, som varit sportchef i klubben under två säsonger, kommer kliva in i styrelsen, där han kommer vara med att fortsätta utveckla klubben framåt. – Jag tror att min erfarenhet från företagslivet och andra styrelser lämpar sig bättre för klubben om jag är med kring arbetet att få klubben att växa ytterligare, och kan lägga min fulla fokus där. Victor är som klippt och skuren för den roll han nu får, med sitt enorma driv och engagemang, och kanske framför allt sitt kontaktnät, säger Christoffer Wickman. – Det känns bra att ha Christoffer i föreningen som haft rollen tidigare som jag kommer bolla en hel del saker med under den kommande säsongen, säger Victor Huerta. Victor Huerta är fullt medveten om det hårda jobb som stundar, och ser ödmjukt på uppgiften. – Givetvis jobbar vi redan nu parallellt med att sondera terrängen på nya futsalspelare som kan förstärka oss till nästa säsong. Jag kommer att fortsätta min roll som U-chef och fortsätta bygga på vår U-verksamhet. Samma sak gäller där med tränare för de lagen och spelare till U-lagen. Johan Ivhall, vice ordförande i klubben, är mycket nöjd med den nya lösningen, och ser med tillförsikt fram emot de närmsta säsongerna. – Victor Huerta är ett drömnamn till den här rollen, och det ska bli intressant att se och följa hans arbete. Victor har varit i klubben länge och känner alla spelare väldigt väl, och han har ett engagemang, driv och ett kontaktnät som är få förunnat.